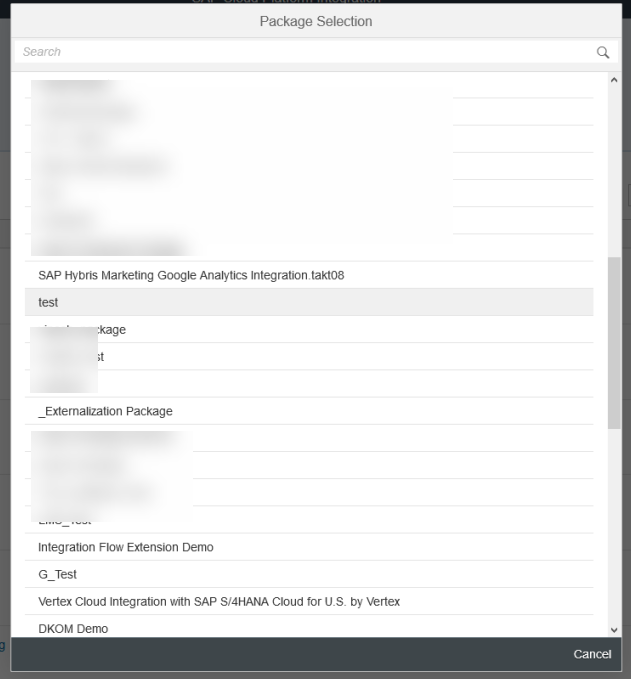 SAP Cloud Platform Integration version 2.45.x comes with enhancement of copying an integration flow artifact within the same package or across different package. This blog describes how to consume this feature. Once the Copy action selected, a dialog window shall be opened with a pre-filled name of the artifact with _copy as suffix as shown below. You can change the name of the integration flow if you wish. By default, the current package name is pre-filled in the Package field, in which, the integration flow will be copied into the current package. E.g. clicking on Copy action button without changing the package, integration flow artifact will be copied with a suffix as _copy. If you wish to copy the integration flow to a different package, you can select another package as shown in the sample screenshots below. Clicking on Select button will open the list of available packages. Select a package where you want to copy the integration flow artifact. E.g., a package named ‘test‘ has been selected. You can observe that, package ‘test‘ is selected for the Package. Clicking on Copy will copy with integration flow into ‘test’ package. Copy integration flow feature will enable you to create similar integration flow artifacts from an existing one, with which you can modify some of the flow steps and/or adapters/connectors according to your needs. Thanks for adding the awesome feature!! This really helps as an alternative option to Template of Eclipse Tooling. If I understand you correctly, you want to copy the flow steps (e.g. Content Modifier, Converter etc. ), adapters/connectors, local integration processes, exception sub-processes etc. within the integration flow? If so, yes, we are working on it and a similar blog will be published once the copy/paste feature within integration flow Web UI editor is available. Wow That would be a great feature. Must needed feature. Thanks for adding. Thanks for sharing this announcement. One of the key usage of this would be duplicating a custom integration flow in a test tenant so that it can be deployed to connect to systems in a different “environment”. On Eclipse, this was relatively easy to achieve by just changing the bundle name in the manifest file before deploying. Currently, doing this on Web UI is a very cumbersome manual process, so having this copy functionality would simplify it somewhat. However, having separate design artifacts (for the same integration flow design) pose the issue of them being out-of-sync should one of them be modified. So will this “Copy” functionality also include an “overwrite” capability if we want to transfer delta changes from one flow to another? Ideally, it would be great if Web UI can have the capability to maintain one design artifact, that can be deployed to multiple runtime artifacts (similar to what can be achieve from Eclipse). I would envision having the functionality to save different variants of the externalize parameters (e.g. different endpoint values, etc), and then during the deploy step we can choose the variant to be used. Regarding copy with overwrite option, we can enhance the said copy feature to have an overwrite option. I will propose this in the product planning and update you once it is available. But still, it will be within the same tenant/design workspace and not across different tenants like test and prod. You need to go with transport option if you want to move the contents from you test tenant to prod tenant. Also, I will discuss the feedback on externalized properties variants and usages of them at the time of deployment with product team and update you later point of time. Thanks for your quick response and assistance to bring this back to the product team. Regarding (1), only same tenant copy/overwrite is required. Typically, we only have 2-tier CPI landscape, which connects to >2-tier end systems, so the CPI test tenant tend to have multiple copies of the same integration flow. How about copy/paste of mapping structures? If you have to do the same mapping logic between multiple source/target fields, you have to create each step manually again and again (only workaround I ever found was to hack the XML from Eclipse, but that often caused problems). Alternatively I ended up writing scripts instead. Or how about creating a “mapping function” functionality like in Boomi where you can group a series of mapping steps and reuse. We will work on to provide copy/paste functionality for mapping structure in upcoming releases. Once that functionality is available, a blog will be published. Thanks for bringing this much-needed feature in Web UI.